UA-59651954-28 Crafty Allie: Homemade Bath Fizzies, Perfect for Valentine's Day Gifts! 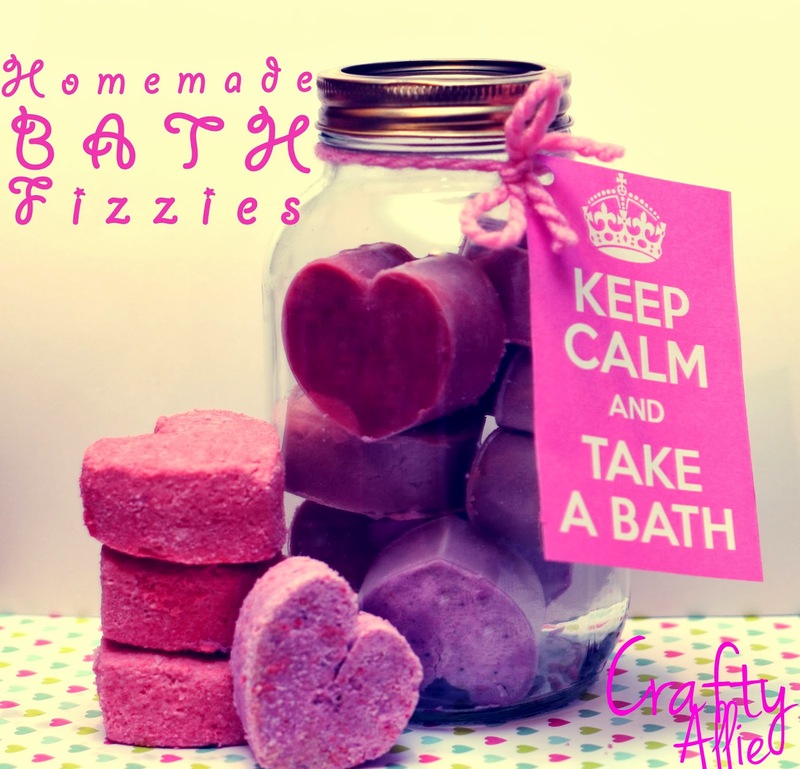 Homemade Bath Fizzies, Perfect for Valentine's Day Gifts! Valentine's Day is soon approaching, which means it's time to start thinking about gifts. Whether it be for a teacher, friend, mom, daughter, or some other loved one. The best part about this gift is... I found a pretty cheap way to make them, without the purchase of fancy expensive molds. I bought some cheap chopping mats at the Dollar Tree. Cut them into strips and then fold it in half and cut it again. So basically, you'll get two hearts for each strip. One Mat made about 36 hearts. Take your already cut strip and very gently fold it in half. If you press too hard it tends to snap. On the non folded side, hot glue a small line on one side facing the outside of the plastic. Then take the other side and curl both ends together and glue them together to form a heart. And now you have your heart mold. Now for the bath fizzies recipe. I found this on Pinterest which then led me to Martha Stewart's site. ***I used baby oil for my essential oil, it totally works and is so much cheaper. I bought a big bottle of it for $2.65. Mix the citric acid, corn starch and baking soda into one bowl, and use a sifter to get out clumps and lumps. After sifting, add in the sugar. Instead of food coloring I used 3 packages of strawberry Kool Aid. It adds color and a strawberry smell (yummy)! Using pipette, add oil, 1 drop at a time, until strength of scent is to your liking. Using your hands, mix ingredients until color is even throughout (mixture will begin to dry out; when this happens, spritz until packable again). Using your hands pack the mixture into the hearts, packing and swiping your your hand with the packed heart, to make the fizzies nice and smooth. On some of the other batches I did add the food coloring. I added pink to one and purple to another batch. Let the dry for at least 24 hours. Some of mine seemed to be still wet, so I left those in their molds. To make 36 of these hearts you'll need to make at least 3 batches. Or make your plastic mat strips smaller like only 1/2 inch and it will then make more fizzies. Mine are about 1 inch thick which is probably why its taking longer to dry. Put them into a jar, and add a cute tag on them. I chose the Keep Calm theme. I love those sayings. UPDATE: My daughter just took a bath and loved the fizz! Love these. I may make these with Emma. Love love them. Awe, I bet she loves taking baths with them. Liz has been wanting to take a bath (as opposed to a shower) every night now. This is just ADORABLE! I really love the "KEEP CALM" sets and I honestly never get sick of them! The colors you chose are just fabulous! I love it, and it caught my eye at the Table for Seven "Share your stuff" party--I had to stop by! I would love it if you stopped by our Facebook page, and said "hello!" These are so cute! Did the food coloring stain the tub at all, or was it ok? Fabulous tutorial! Love how you made the heart molds!! Thanks for linking up at Share it Sunday!! How fun! Thanks for sharing the tutorial. 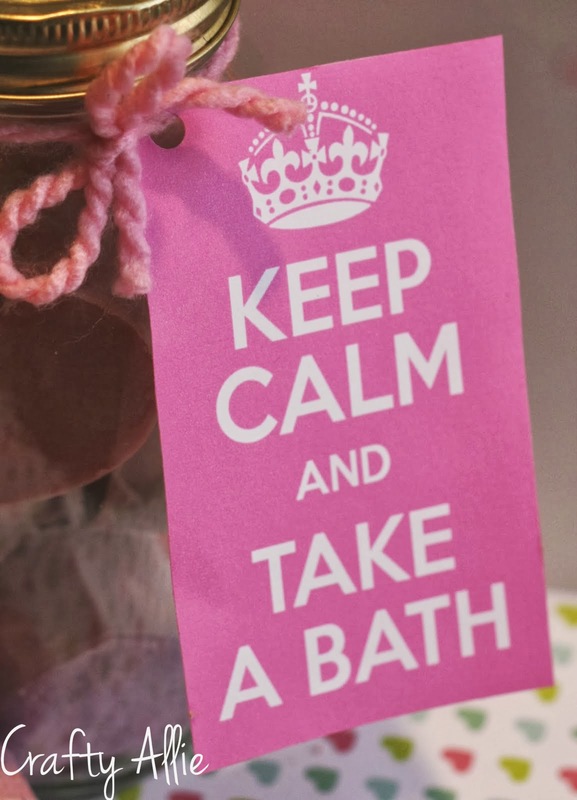 I love your tutorial on making Valentines Bath Fizzies. This is a great idea and will be enjoyed at the end of the day. Thank you for sharing with the Clever Chicks Blog Hop! I hope you’ll join us again next week! These are so cute! I love the Keep Calm tag. Thanks for linking to the In and Out of the Kitchen Link Party. Hope to see you next week. Oh these are lovely. What a gorgeous gift! These are so cute. We need to make some. How fun!!! 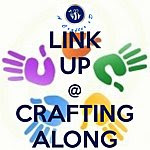 Thanks for linking them up in the Crafty Showcase this week! You are being featured this afternoon on our Facebook page! woot woot! These look so fun and I love the homemade mold idea! Thanks for sharing this at What We Accomplished Wednesdays! Have a super week! love these - I assume you could use any flavor of koolaid I wonder? Some of those punches smell good lol. Thanks for linking to Snickerdoodle Sunday!! For sure you could. I just did strawberry for the scent and to make it pink. What a great idea for easy molds! You've been featured at Gingerly Made today! Thanks Ginger! I added your featured button! Interesting with the usage of koolaid but what a genius idea! These are great for gift giving and even to splurge on yourself! Hello Friend! Will send an email as well. Hope you are doing ok. Sharing this as part of the page of the day over at sunday features today. Big hugs. Thinking of you. These are adorable! These would make great gifts. I love it. I can't wait to try it for myself. Thanks for linking this up to Totally Terrific Tuesday! I can't wait to see what you have to share this week! I wouldn't have thought to make the molds that way :) Great tip. Very fun read.